As per recent years, Liverpool have shot a lot this season. Their 339 non-penalty shots is the second highest total in the league (Man City have just 9 more), but unlike last season they have managed to put more shots on target than any other team. 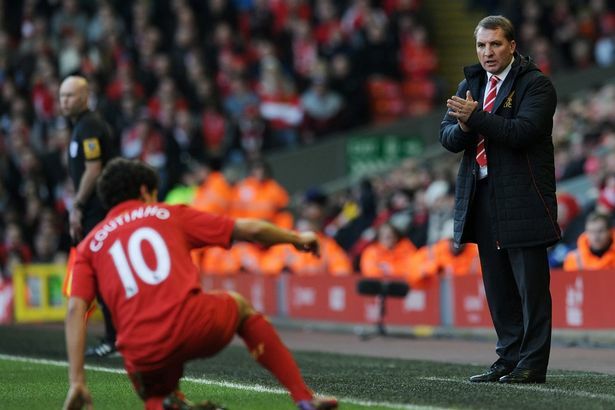 Last season just 29% of Liverpool’s shots were on target, this season the accuracy has increased to 37%. Can the shot locations explain the accuracy increase? Are shots being taken from better spots than last season? Or is the increase in accuracy just one of those things that happens from time to time? If you require an explanation of the zones used in these images please scroll down to the bottom of this article. Otherwise we’ll jump straight into their charts. 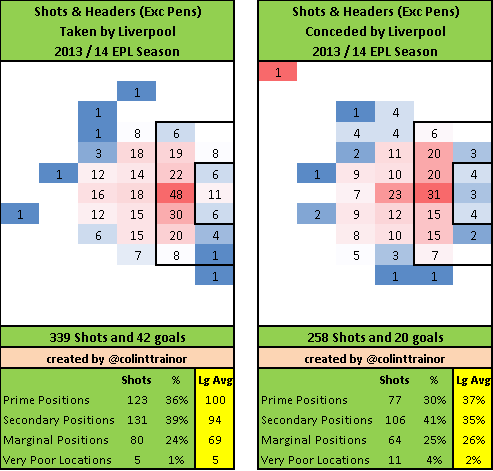 In both seasons 36% of shots taken were from Prime positions, however Liverpool have marginally improved their average shot position this season by increasing their shots from Secondary positions by 4% at the expense of shots from the Marginal Positions zone. 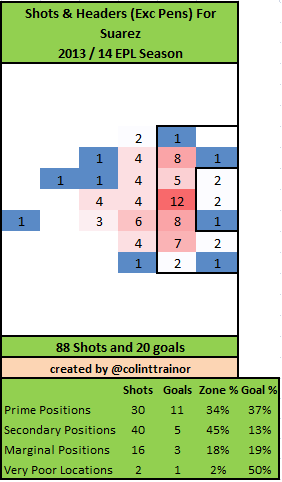 Still, any improvement in goal expectation as a result of their shooting locations is pretty minor and is not the reason for the marked improvement in shooting accuracy. Perhaps the players practised their shooting last Summer or more likely they are finally riding the upturn in variance they were due after the last few seasons’ poor shooting returns. Looking at the bigger picture, 36% of shots from Prime locations is quite low for a title challenging team. We have already seen that Man City and Arsenal have taken 47% and 45% respectively of their shots from Prime positions. 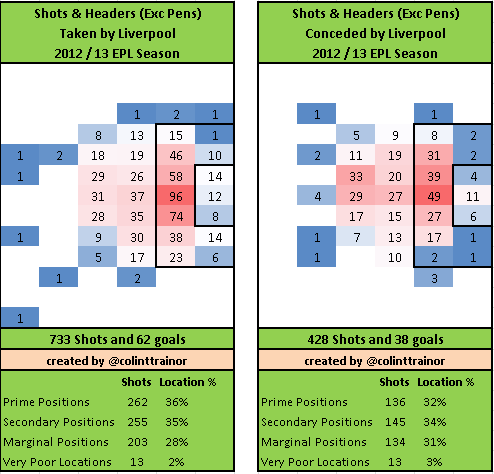 In fact Liverpool are decidedly mid-table in terms of shooting positions as there are only nine teams that have taken a lesser percentage of their shots from Prime spots. So there is still room for improvement. Defensively, it’s a tale of two halves – shot volume and shot quality. Liverpool concede too many shots. Even Crystal Palace and West Brom have conceded fewer non-penalty shots than the Anfield team. In fact, 11 teams in the Premier League have conceded fewer shots than Liverpool, that must to be a worry for Brendan Rodgers. 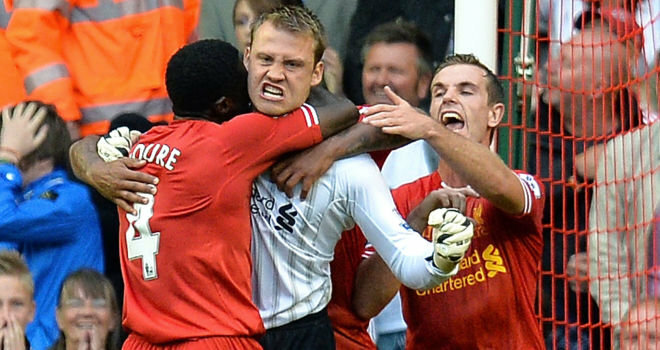 Regardless of the quality of the shots conceded, if they take enough heavy pounding eventually a few more goals will sneak past Mignolet; this is something that Liverpool need to avoid in order to cement their place in the Top 4 at the end of the season. Liverpool have excelled on the other side of the defensive equation – the quality of shots that they allow the opposition to take. Just 30% of shots they face are struck from Prime locations, only Arsenal (at 27%) can boast a rate that is more impressive than this and the quality of the average shot they face is the second worst in the league. So almost top marks in this regard. Liverpool currently provides two of the top four Premier league players in terms of shot volume. Luis Suarez has scored with almost 23% of his shots this season whilst Philipe Coutinho has scored with just over 3% of his attempts; chalk and cheese indeed. The average goal expectation of Coutinho’s shots is just over 8% per shot, this equates to an expected goal total of almost 5 goals per our model across his 59 shots. It can clearly be seen that his return of 2 goals puts him below expectations in terms of his scoring tally, but with his expected goals total being so low it’s probably not fair to plot a curve for him. Just one or two more goals (if they ever come) would greatly change his place on the shooting curve. However, I can make one solid conclusion; Coutinho is shooting at the 4th fastest rate in the Premier League and he should throttle back how often he pulls the trigger. Shooting an average of more than 4 shots per90 is not smart play when so many of them are from outside the Penalty area. He’s 0 for 36 from outside the area this season; someone please have a word with him. Now that we have discussed the chalk, let’s move on to the cheese, the Big Cheese – Luis Suárez. What Suárez is doing this season is amazing and 20 goals in just 15 appearances is obviously a terrific achievement in the Premier League. He’s always been a very busy player, so there’s no merit in analysing his volume of shots but rather I’ll spend my time looking at where those shots are taken from and how he is converting them. It goes without saying that his 2013/14 conversion rate of 23% wasn’t achieved in previous seasons, but I’m interested in learning more by going beyond the raw goals scored. Looking at his shots on target figures we see that in the two previous seasons his on target numbers were consistent at 37%, but this season he is putting every other shot on target (50%). As well as experiencing an increase in shots on target the real kicker for Suárez this season has been that opposition goalkeepers have saved just 55% of his shots that were on target; the league average in the Premier league is 70% this season, as it was last season also. So Suárez has been way more accurate with his shots this season, and in turn much more of those shots were unable to be stopped by the opposition goalkeepers. Establishing the facts is important, but it’s more important (as well as more fun) to try to understand how these numbers have come about. For example, where is the Uruguayan shooting from this season, and are they from different spots to previous years? He had some really weird shooting figures in 2011/12. A huge amount of his shots were from Prime positions, yet this was the season that he posted his lowest scoring percentage. As well as being very unlucky in experiencing a 77% save rate in his on target shots, the shot locations would suggest that he was playing a different type of role that season. From 59 Prime zone shots he scored just 8 goals, this season Suárez has scored 11 goals from just half as many shots (30)!! However, what’s most interesting for me from those images is that the places Suárez is taking his shots from this season is not that much different from last year. 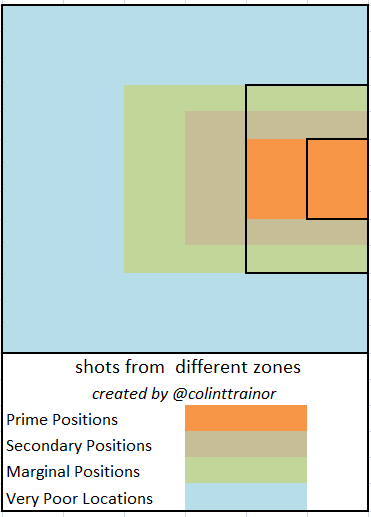 Like Liverpool, as a whole, the proportion of shots from Prime positions are in line with last year and he has improved his Secondary position numbers, but only by a few percentage points. Using our ExpG values, Constantinos Chappas and I evaluate each shot in terms of how likely a goal is to be scored. It simply provides a quantitative method of comparing shots and so is useful for this task at hand. Naturally, the Avg ExpG value for each season rises and falls in line with the zones where the shots were taken from. The small improvement in where Suárez took his shots from this season can be seen as his average ExpG per shot has increased from 11.4% to 12.8%. However, this improvement gets nowhere close to explaining how the striker has scored 20 goals this season. Our model pegs his expected goals tally this season at about 11 goals, hence the stated over performance of approximately 9 goals compared to our numbers. If I were a Liverpool fan the question that I would want answered is whether his terrific scoring rate is based on a shift in fundamentals, and thus is likely to be on-going. I’m afraid the answer to this question is “no”. The types of shots Suárez is taking are not substantially different to last season and in fact they appear not to be as good as the chances he had in 2011/12. The continual improvement in his scoring performances over the past two and a half seasons when compared to our ExpG values does suggest a player that is getting better with each season. However, the magnitude of his over performance this season suggests the scoring run he is on just cannot continue on its current trajectory. That’s not to say that he’ll go back to similar conversion rates experienced in 2011/12, just that his rate has to dip somewhat. For all three of the seasons under examination I took each of his shots and simulated them 10,000 times. 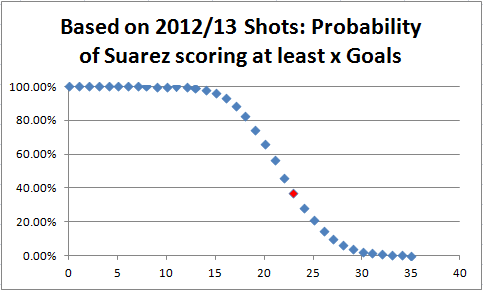 The following curves are the visual representation of how likely, according to our model, Suárez was to score at least x goals (as labelled on the horizontal axis) based on the shots that he had. The red dot represents the actual number of goals that he scored in each season. 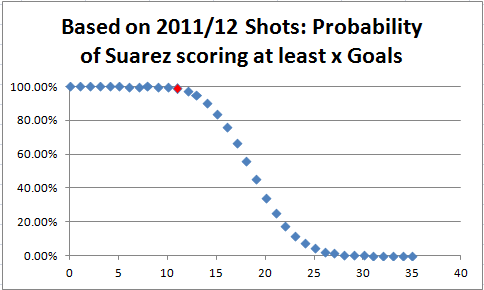 98.6% of the simulations of the shots Suarez had in 2011/12 achieved at least his tally of 11 goals. 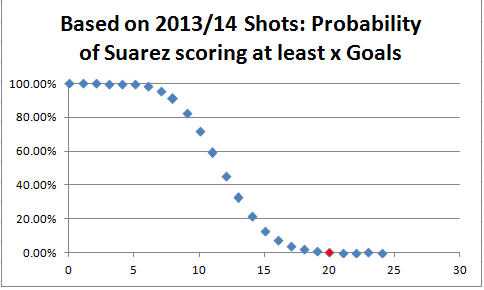 This number helps to put in context just how unlikely Suárez was to score less than a dozen goals that season. I’m quite sure that the save ratio of 77% during this season will explain some of that under performance. In 2012/13, only 37% of the simulations achieved at least his tally of 23 goals. This clearly puts him “ahead of the curve” last season as he has gone beyond the cumulative total of 50% which is where our ExpG value would have pitched him. The improvement in finishing has continued, but my word the numbers this season are scarcely believable. In only 0.27% of runs (1 in every 400) did my simulation score the 20 goals that Suarez has managed in real life!! I’m not taking anything away from Suárez here, I’m merely pointing out that given his shots, he is on one of those scoring runs that came up in just 1 in every 400 simulations. Long may he savour it. In early November when Aaron Ramsey was at the peak of his goal scoring exploits (6 goals in his first 23 EPL shots this season) I ran the same simulations in this article. I pointed out that given Ramsey’s shots, in only 0.85% (1 in every 120 simulations) of cases did he score 6 goals. Since that time the Welshman has had 17 further shots and added just 2 more goals to his tally. In that Arsenal article I set out that the shots Ramsey was taking was not consistent with an ability to continue the goal scoring streak that he was on. And so the circumstances are similar here. Will Suárez break 40 league goals? Suárez has scored 20 goals in 15 games. He has 18 games left, and assuming he plays every game and scores at the same rate as the first half of the season he would rack up another 24 goals which would result in him scoring 44 league goals. I don’t think that scoring rate will be achieved. Hell, I don’t think anyone actually believes that. So what do I think is a sustainable goal scoring rate for Suárez from now until the end of the season? Given that he can keep up his very high shot rate, almost 6 per game, I could see Suarez scoring at the rate of 0.75 goals per game. This would see him tag on another 13 goals which would see him finishing the season with 33 goals – still a very fine achievement. 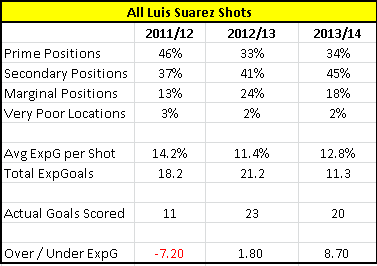 Suárez’s shooting wasn’t as bad in 2011/12 as the bare stats would suggest and the reverse is also true in the current season where his shooting isn’t as exceptional as his 20 goals would suggest, even taking into account the increase in shots on target. 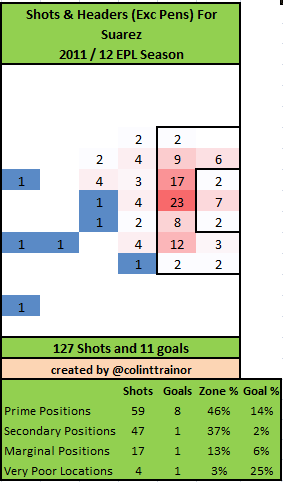 I make these statements with some certainty as the combination of shot locations and actual shot placements this season suggests 15 goals would have been a fair return, this is more than the 11.3 suggested by location but less than the 20 actually scored. 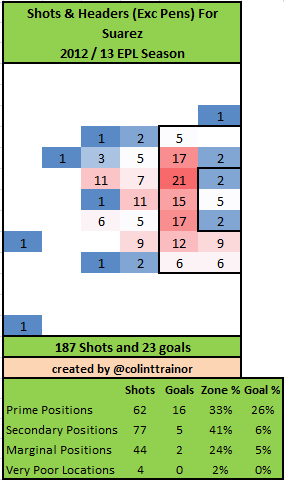 Conversely two seasons ago his shot placements suggested 16 goals, less than the 18.2 ExpG but considerably more than the 11 he actually scored. It is difficult to comprehend that the one player could have a truly abysmal finishing performance in 2011/12, but then just 2 years later he’s off the chart at the other extreme. Is that due to luck or skill? Without sufficient data to be sure I assume it’s a combination of both but it’s important to recognise that he was virtually as bad / unlucky (delete as appropriate) two seasons ago as he has been good / lucky in this current season. I have one final image that nicely represents this point, ie the trade off in performance between the two seasons. The following chart plots cumulatively his ExpGoals and Actual goals scored from the beginning of the 2011/12 season until the present time. I know that Paul Riley has done something similar with slightly different results, but over the last two and a half seasons we have Suarez less than 4 goals ahead of expectation. Luis Suárez has arrived close to his intended destination it’s just that the journey has been anything but smooth.